Secret Cove Resort, Halfmoon Day, B.C. We’ll all soon be on the road again for another full day of travel. I’ll see you all when I am once again state side! It has been wonderful here and, of course, now that we are leaving the sun has come out. I just got some great shots of starfish on the beach. I’ll share them later. Roughing it, Ella? Safe travels. Boy, the time sure did go by fast. I can tell you’re having a really tough time!!! You and Ella both. Hope to see you Monday after all!!! If it’s another 12-hour trip, it will be might late when you get home! Hope you are having a safe trip. Safe trip home, glad you had a good time. Hope you have safe travels. Safe travels my friend! I’m sure you’re home by now… but I wished you safety anyway! Have a nice trip, Quilly. We are traveling also, from Texas to Louisiana. Mrs. Jim’s cousins are having their 60th wedding anniversary celebration. I probably won’t be bloging either. But then? Oh yes, KP is coming with us. She will keep us pretty busy. But we have to show her off to Mrs. Jim’s family before she leaves to live in London. Sorry Quill, haven’t read the post yet. But did you know Mrs. Jim Hovendick is the Belle of New Orleans? 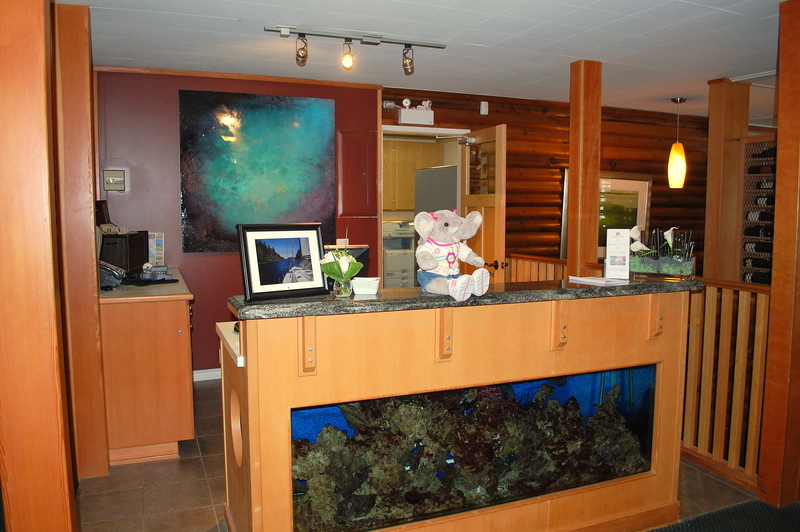 Oh that’s a lovely reception desk and area and Ella looks great! Have a safe trip. Looking forward to seeing those starfish! i’d love to see those starfish pics, quilly. oh, ella looks so contented there. Glad to see what a terrific time you’re having. I love seeing what you’re up to while I’m closeted in my room recovering. Looks like it was a great trip. Happy trails & get home safe.